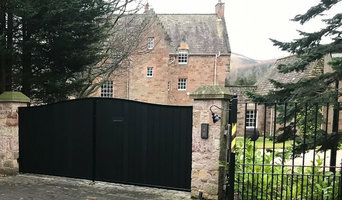 AES (SCOTLAND) LTD - Premier Installers established in 2003. AES (SCOTLAND) LTD are specialist installers, with a wealth of experience in the installation of electric gates, security fencing, automatic barriers & industrial roller shutters. We supply and install electric and manual gates, industrial gates - including maintenance, servicing and repair, industrial security fencing, industrial roller shutters, automatic and manual car park barriers, automatic rising bollards and rising kerbs, parking bollards and anti-ram raid bollards, industrial doors and fast acting doors, access control systems - including GSM intercoms and garage doors, for new and existing properties in Scotland. HERE AT AES, WE PRIDE OURSELVES ON PROVIDING .... • 28 years of experience. • High technical ability. • High standard of workmanship. • Competent & vastly experienced installation engineers. • Our full commitment to safety & customer satisfaction. • High quality driveway gates that will enhance the value of your property. • The very latest automation technology. • Full bespoke installations. • Service and support during and after your installation. • Full public and employer’s liability Insurance. • A minimum of two years full warranty on all automation installations, with ongoing affordable gate servicing and maintenance packages. • And most importantly – a company that you can place your trust in, one that will be there to genuinely honour warranties on all work carried out. Please see our website for more information.